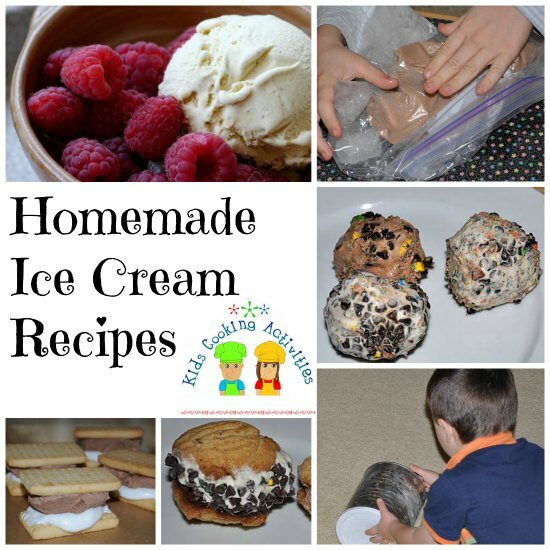 Homemade Easy ice cream recipes. Summer time is the perfect time for easy ice cream recipes. It is a way to cool off and enjoy a treat under a shady tree. 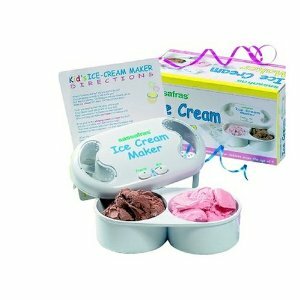 Whether it is homemade ice cream recipes in a ice cream machine or a different method, we have the ideas and the recipes. In a saucepan stir together eggs, sugar and milk. Cook on low heat . Stir constantly for 8-10 minutes until mixture starts to thicken. Set off stove and allow to cool. In separate bowl, stir cream and vanilla together. Pour into cooled milk mixture. Chill several hours. Then run through ice cream machine. To make a Chocolate Recipe, stir in ¼ cup cocoa powder with the sugar and milk mixture. Cook and follow recipe above. Wash strawberries and remove stems. Stir ½ cup sugar and strawberries together then set aside while preparing remaining recipe. In saucepan stir together eggs, cream, milk, ¼ cup sugar and vanilla. Cook on low heat. Stir constantly about 6-8 minutes until mixture starts to thicken. Add strawberries to cream mixture and stir together. Chill in fridge several hours then run through ice cream machine. An easy ice cream recipe that includes a little peppermint candy flavor. Combine ingredients together and pour into ice cream machine or use the roll a can method. (below). Try this peppermint ice cream recipe. In saucepan, combine eggs, milk, sugar and salt. Cook and stir constantly until mixture reaches 160 degrees on a candy thermometer. It will coat a metal spoon. Set aside and allow to cool. Then stir in cream, vanilla, peppermint extract and food coloring. Chill for 2 hours. Stir in chocolate chips. Fill ice cream freezer cylinder 2/3 full; freeze according to directions. Refrigerate remaining mixture until ready to freeze. Combine all ingredients together then pour into ice cream machine. Don't have an ice cream machine? Try the roll a can method. Layer crushed ice and rock salt around the small 1 lb. Can. Cover both cans with their plastic lids. Tape shut if you'd like to make sure it remains sealed. Get several people to help or at least two helpers. 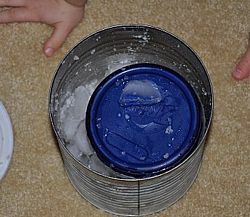 Sit in a circle on the floor and roll the can back and forth for about 15 minutes or until ice cream thickens. Science behind homemade ice cream. The salt lowers the freezing point of the ice. Meaning your ice cream freezes gradually. The mixture of the salt and ice helps freeze your ice cream quickly. (But it will still take 10-20 minutes to be ready) You will start to see condensation on the outside of your can, this will show you that it is working! 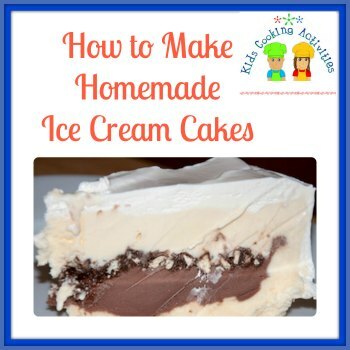 These are a lot of fun and super easy ice cream recipes kids can have fun putting together. The technique is different then the rolling a can method only because you are squeezing the bag and tossing it around but the science behind it is still the same. You might want to get your winter gloves out for this activity- it gets cold! Add cream, sugar and vanilla into small baggie and zip closed. In larger baggie add ice and rock salt. 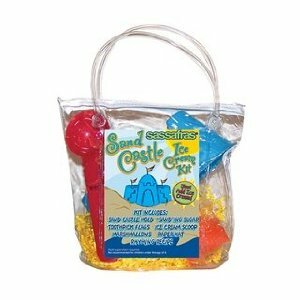 Place smaller ice cream filled bag inside larger rock salt baggie. Seal bag closed. Double check to make sure both are sealed tight. Squeeze, toss, wiggle, play catch with the bag until mixture thickens about 10-15 minutes. Eat with a spoon. For a Chocolate baggie ice cream recipe add ¼ teaspoon cocoa powder or 1 tablespoon chocolate drink mix powder. For a Malted milk flavor add 1 tablespoon malted milk powder. Add ingredients in a Ziploc bag and squeeze together to combine. Freeze several hours. (Or use the method above) When ready to eat snip a corner off a bag and squeeze out or eat with a spoon. Easy ice cream recipes that are a twist on the traditional s'more. Break graham crackers in half to make squares. 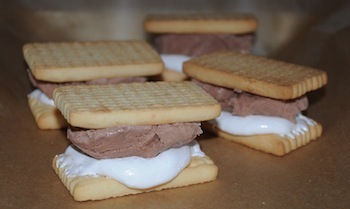 Top each cracker with a scoop of ice cream and a spoonful of marshmallow crème. Top with another graham cracker square. Wrap up in plastic wrap and freeze several hours. 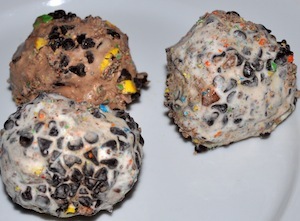 Crush nuts, cookies or candies that you would like to roll ice cream balls in. Place crumbs in a bowl. Set out a sheet of waxed paper on top of a cookie sheet. Allow ice cream to sit out a few minutes and become soft. 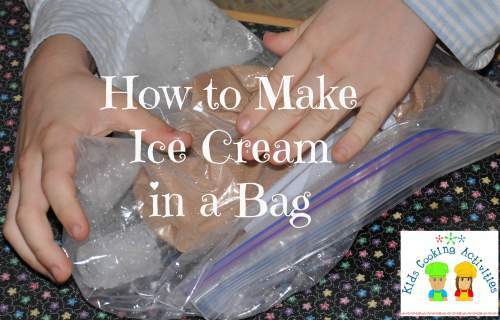 With plastic gloves or clean fingers take a scoop of ice cream out and roll into a ball with your hands. 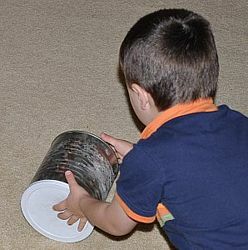 Set ball into crumbs and roll around to coat. Set on waxed paper cookie sheet. Set in freezer. Freeze several hours. 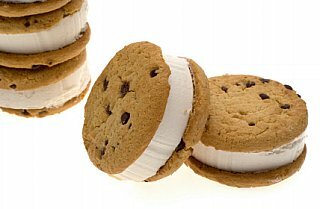 Place a scoop of ice cream between two flat cookies. Press together. Roll outside edges with crushed nuts, cookies or candies, if desired. Wrap up in waxed paper and store in the freezer several hours. You can change the look and flavor very simply with this easy ice cream recipe by changing the ice cream flavor or use a variety of crushed cookies and candies. Invite friends, neighbors or family and have an ice cream social. Include several flavors of ice cream or have each person bring their own favorite flavor. Have available at the party chocolate, caramel, strawberry syrup and fresh fruit such as chopped pineapple, sliced strawberries and cherries. This can be a great event when the weather is hot outside and no one wants to cook. 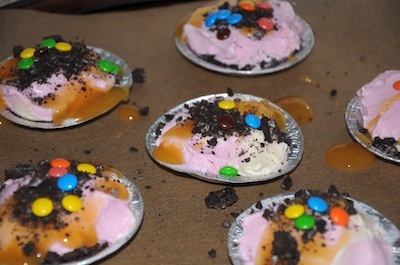 Check out our Sundae kids cooking party where kids can make cookie cups and build their own sundae. These easy ice cream recipes can be as simple as you would like them to be. Prepare or buy a graham cracker crust. You can use plain graham crackers or a different variety of cookie crumb crust. Allow ice cream to soften by leaving out several minutes. Spread ice cream into pie shell. Top with chopped nuts, mini chocolate chips, drizzle chocolate sauce over the top or leave as is. Refreeze several hours. Follow the directions for ice cream pie above but make them in mini pie plates or mini tart dishes. Prepare graham cracker crust and fill with softened vanilla ice cream. Drizzle peanut butter sauce over top of ice cream. Sprinkle with chopped peanuts and drizzle with chocolate sauce or leave as is. Refreeze several hours. Stir vanilla ice cream and pink lemonade together. Add in whipped cream and stir until smooth. Pour into pie crust and freeze. Top with fresh sliced strawberries. Make this easy ice cream recipe in a pie dish or a casserole dish. No pie crust needed. Soften ice cream by leaving out for a few minutes. In 9x12 cake pan crumble Oreo cookies over bottom. Place ice cream on top. Arrange Oreo cookies along side of pan for decoration. Drizzle top with Hershey's syrup and refreeze. In saucepan, combine first four ingredients. Cook and stir until sugar is dissolved and smooth, about 4 minutes. Remove from heat and stir in peanut butter until smooth. Cool and serve on top ice cream and sprinkle peanuts on top. In saucepan add sugar, cocoa, salt, butter and water together. Stir constantly on medium heat until mixture comes to a boil. Continue to cook and stir about 1 minute. Set aside and add ¼ teaspoon vanilla. Cool off slightly and serve warm with ice cream.